— The Mediterranean’s favourite year-round herb. Discover Rosemary’s traditional uses as well as its newly researched topical benefits. Rosemary has been hailed since ancient times for its medicinal properties. Traditionally, this herb was used to help alleviate muscle pain, improve memory, boost the immune and circulatory systems, and promote hair growth. 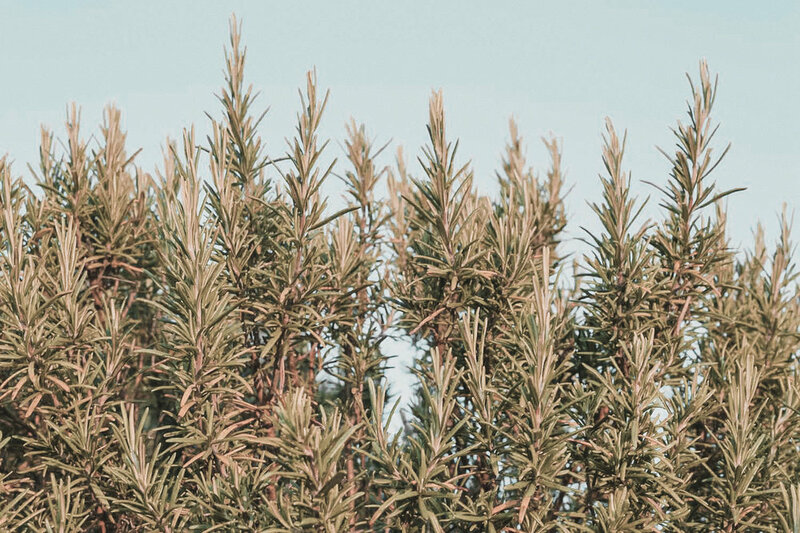 Native to the Mediterranean, Rosemary is a fragrant evergreen herb used predominantly as a culinary condiment, however has its benefits in fragrance and cosmetics. A rich source of iron, calcium and vitamin B6, Rosemary has a diverse range of possible health benefits. The α-pinene in Rosemary works to alleviate swelling and pain, boost immune system function, and improve blood circulation. The topical use of rosemary oil has been found to improve blood circulation. When blood is circulating well, pain relief and clotting can be minimised, speeding up the wound healing process and promote hair growth. Reduces Acne and Fights Signs of Ageing. With its anti-inflammatory properties, Rosemary can help reduce acne by exhibiting potent antimicrobial activities against acne-induced inflammation. It also fights against sun damage and free radical damage, toning and tightening skin by contracting the skin tissue. Rosemary is also a rich source of manganese, a mineral that assists in minimising wrinkles and protecting the skin from external damage. ﻿Boosts Hair Health. Rosemary is found to be beneficial for the loss or thinning of hair, and to alleviate dandruff. Alongside this, Rosemary has been found to stimulate hair growth and assist in treating conditions such as alopecia. The benefits of Rosemary can be found through eating, drinking or topical use of the herb. It can be taken as a supplement or steeped in tea, both of which have the same effects on the skin’s overall health. If using Rosemary in essential oil form for topical benefits, it shouldn’t be used without diluting it slightly or alongside a carrier oil, such as coconut, avocado, evening primrose or olive oil. How do you use Rosemary in your life? Do you have Rosemary in your skincare products?